Arrive Mumbai and you will be received from the International airport and will be transferred to hotel,check in at the hotel, later proceed for a sightseeing to Mumbai covering gateway of india, Regal Cinema Circle. Just after the Gateway is the Regal Cinema circle. Back to hotel and overnight stay at the hotel. After breakfast you will be transferred to Mumbai Domestic Airport and proceed to Hubli by Air,you will be received at airport and will be transferred to Badami,check in at the hotel,overnight stay at the hotel at Badami. Morning breakfast and check out and proceed to Badami. On arrival check in to the Hotel, Lunch and half day sight seeing visiting to Badami Caves Picturesquely situated at the mouth of a ravine between two rocky hills, the exquisite sculptures and the rust red sandstone cliffs of Badami tell many a tale of yore, North Fort – This is the largest enclosure, including two major platform structures, an underground chamber which must have served as a treasury or private audience hall, several other platforms, Banashankari – is a quaint hamlet taking its name from the goddess Banashankari. Built in the Dravidian style, the temple is dedicated to Banashankari, a form of Parvati. Return back to hotel and overnight. Morning breakfast, checkout and proceed to Hampi- the World Heritage Center, is the most beautiful and evocative of all the ruins of Karnataka. Capital of Vijayanagar kingdom is full of delightful surprises. On arrival check into a hotel. Overnight. Day is free to relax enjoy the in house facilities and overnight stay at the resort. After breakfast proceed to Hassan,check in at the hotel,after lunch visit Hoysala Temples of Halebid & Belur. Visit the Hoysaleshwar Temple at Halebid which is the most outstanding example if Hoysala art. At Belur, visit the Channekeshava Temple is the only one at the three Hoysala sites. Morning Proceed to Mysore the capital of warrior King Hyder Ali and his son Tipu Sultan. Srirangapatnam has a number of magnificent monuments that are important tourist destinations and are well worth a visit. 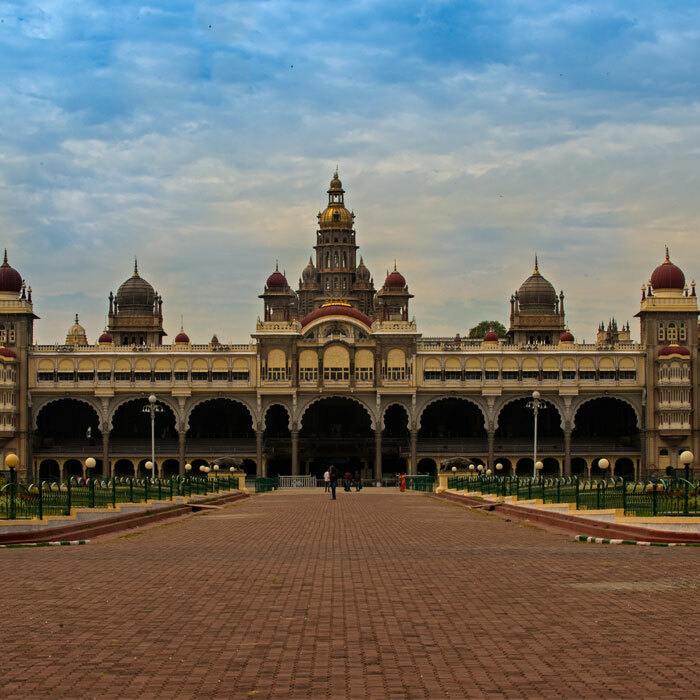 After you go back to the hotel and freshen up the itinerary includes a trip to the Mysore Palace, which was once the residence of the Woodeyars. Check in at the hotel, overnight stay at the hotel. Check out and proceed to Bangalore after sightseeing of Bangalore,check in at the hotel and overnight stay. Check out at 09 00 clock and proceed to Bangalore,you will be transferred to Bangalore airport,depart to Kochi by Air,On arrival at Cochin airport you will be received by our representative and proceed to your pre booked hotel at cochin. Cochin (colonial name Cochin) is a vibrant city situated on the south-west coast of the Indian peninsula in the breathtakingly scenic and prosperous state of Kerala, hailed as ‘God’s Own Country’. Informally, Cochin is also referred to as the Gateway to Kerala,Check in at the hotel, overnight stay at the hotel. After breakfast, proceed for a sightseeing of Kochi covering Fort Cochin, attractions are the Basque Da Gama Square, the Basilica of Santa Cruz, San Francisco Church, VOC Gate, Bastion Bungalow, Jewish Synagogue, Mattancherry Palace, etc. Learn the operation of fishing nets interesting of Chinese built teak and bamboo poles work on the principle of balance. The records say it was established here between 1350 and 1450. Basque Da Gama Square, the narrow promenade that parallels the beach is the best place to watch the nets down and pulled out of the sea, overnight stay at the hotel. Check out after breakfast and proceed to Sightseeing at Kochi and will be transferred to Munnar, The word “Munnar” means three rivers. 3 mountain streams (Madurapuzha, Nallathanni and Kundala) are joining together here. During the British rule in India, Munnar was the summer resort of the Government officials. The natural beauty, calmness and mild cold climate throughout the year make it a favorite tourist destination. There are about 30 tea plantations in and around Munnar. The tea estates, hills, lakes and forests inside Munnarrange encompass its beauty. The Munnarhills are covered by tea plants, which give a feeling of seeing a wide green carpet. After breakfast proceed for a full day sightseeing trip Mattupatty,Kundala,Eco point followed by a visit to Pothamedu which offers an excellent view of the tea, coffee and cardamom plantations in Munnar. The rolling hills, the lush mountain and the breathtaking scenery here is ideal for trekking and long mountain walks surroundings is a good picnic spot,after lunch visit Tea Museum and Blossom Park,Later visit the Rajmalai Wild Life sanctuary – this is the only sanctuary in India where Indian Ibex’s are found, followed by a visit to Kannan Devan Hills. From here you can have a panoramic view of Munnar Tea Estates & the Lake of Munnar, over night stay at Munnar. Check out after breakfast and proceed to Thekkady, The periyar wildlife sanctuary – Lying close to the plantations, in the rich jungles of periyar in thekkady is one of the world’s most fascinating natural wildlife reserves – the periyar wildlife sanctuary, spread across 777 sq km, of which 360 sq.km is thick evergreen forest, the periyar wildlife sanctuary was declared a tiger reserve in 1978. The splendid artificial lake formed by the mullaperiyar dam across the periyar river adds to the charm of the park. This is the only sanctuary in india where you can have the unique experience of viewing wildlife at close quarters from the safety of a boat on the lake. After breakfast proceed to the wildlife sanctuary at Periyar/Thekkady and check in at the Hotel/Resort. Go on an evening game viewing cruise on the Periyar Lake. Here you will be able to see a large variety of wildlife, which include elephants, monkeys, deer, wild boar etc, and quite a lot of unique birds can also be spotted. Later, come back to the hotel; relax & enjoy your stay overnight. After morning breakfast, Check in at the houseboat Enjoy the magic of backwater by going on a Houseboat(Kettuvallam) cruise across the backwaters. Spend the next 22 hours in your floating villa. Enjoy the backwaters of Kerala by getting a glimpse of the village life at close quarters; a unique and unforgettable experience. Enjoy the sunset & stay overnight on the houseboat. After breakfast check out from the hotel and proceed to Hotel at Kovalam. Check in to your Hotel. Kovalam is an internationally renowned beach with three adjacent crescent beaches. It has been a favorite haunt of tourists, especially Europeans, since the 1930s. A massive rocky promontory on the beach has created a beautiful bay of calm waters ideal for sea bathing, Overnight stay at Kovalam. After breakfast full day is at Leisure at the beach resort,or visit museum,Palace and Shankumukam Beach,oevrnight stay at Kovalam. Kanyakumari is a small but exceptionally beautiful town, located on the confluence of three oceans the Indian Ocean, the Arabian Sea, and the Bay of Bengal. Kanyakumari is referred as the southern most tip of the Indian subcontinent. The name of Kanyakumari is derived from two Hindi words ‘Kanya’and ‘Kumari’ which translates into the ‘virgin girl’. It’s because that the place is named after the beautiful princess Kanya Devi, one of the many forms of goddess Parvathi, the consort of Lord Shiva. For its association with the goddess, Kanyakumari is regarded as one of the most sacred pilgrimage centers for the Hindus. The town houses several beautiful temples including the one dedicated to Goddess Parvathi. Evening see the sunset. Overnight stay at Kanyakumari. After breakfast check out and proceed to Madurai. Check in at the hotel evening proceed for a sightseeing trip to Madurai, Places of tourist interest include the imposing Meenakshi Temple, Thirumalai Nayakar Mahal, Gandhi Museum, Azhagar Koil and the Vandiyur Mariamman Teppakulam. Overnight at hotel. Check out after breakfast and proceed to Chennai by Train,arrive chennai in the evening,you will be received by our representative at Chennai Egmore railway station and will be transferred to hotel in Chennai,overnight stay at the hotel in Chennai. Check out and you will be dropped at Chennai international airport 2 hours prior to departure, Tour Ends.